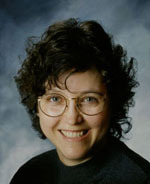 Gail Hamlin is a poet as well as a nonfiction author, associate publisher, and editor of over 30 reference books pertaining to Native Americans and United States history. A journey of love and faith produced her newest book, Prophetic Utterances: The Cry of His Heart (Volume 1, 2018). You’ll find Gail on her website at Gail-Hamlin.com and on Facebook and Instagram. What is your elevator pitch for Prophetic Utterances? 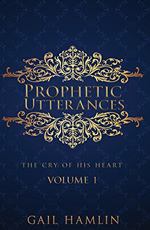 My book Prophetic Utterances: The Cry of His Heart reveals the heart of God, and it shows His immense love for His children. He says, “My sheep hear My voice,” and through these prophetic utterances, He is speaking to His children. He speaks not only of His love, but He warns them to prepare themselves for what’s ahead. These prophetic utterances are a foretelling of events to come. I want them to know just how much they are loved, and that Jesus’ coming is nearer than they think. It was hearing the still, small voice of God and interacting with Him. I appreciate that He trusted me enough to share some of His heart, words, mysteries, and secrets with me. It was an experience that cannot be fully understood with the natural mind. The inspiration for it came about as a result of answered prayer. I wanted to write a book written by God, not by Gail. I asked Him to give me something new to write about, and He did that on two separate occasions. The first time was in 2002, when I was awakened from a sound sleep at midnight with all kinds of words running through my mind. I began to write what I heard, and this lasted for three days and three nights. The second time was in 2013, when the words started pouring through my mind again—only this time, it lasted for five weeks. There was a rhythm to the words, and pauses as well. I learned to stay in sync with God as He gave me these writings. The amazing part to me was how similar the writings were, even though these two experiences were many years apart. They came at all hours, with some sessions lasting three to four hours at a time. Some of the writings were preceded by visions and dreams. During this time I had a vision of the hand of God over my hand while I was writing; I saw the lower part of His arm covered in a white robe with His fingers outstretched over mine. I wrote the book over a period of five years before having it edited and published. This is a nonfiction book, but do you believe it contains a character or characters? Yes, I do. God is the main character and also the author (Omniscient Narrator). We (His children) are minor characters. There is another character who is written about, and that is Satan, and he is quite the character…. Do you have a favorite quote from Prophetic Utterances that you want to share? Don’t give up! Push past all the obstacles, all the fear and doubt, and all your insecurities. And above all, pray! The writings came to me like a scroll; some were so long that I had to figure out how to break them up into bite-size pieces for the reader to chew on. So, I used the first line of each new topic for the title. There were more writings than I could put into one volume, so a second volume will be published. I encourage the reader to allow God to speak to them through these writings. God is speaking all the time and in so many ways that people often don’t recognize it’s His voice. They might credit their own mind and ingenuity without realizing it’s God’s ingenuity that He is passing along to them.